Manager of South Philadelphia Stained Glass, Frank Sorrentino. His worn, brittle hands betray the warmth and pep in his voice, for 80-year old Frank Sorrentino is far from retirement. 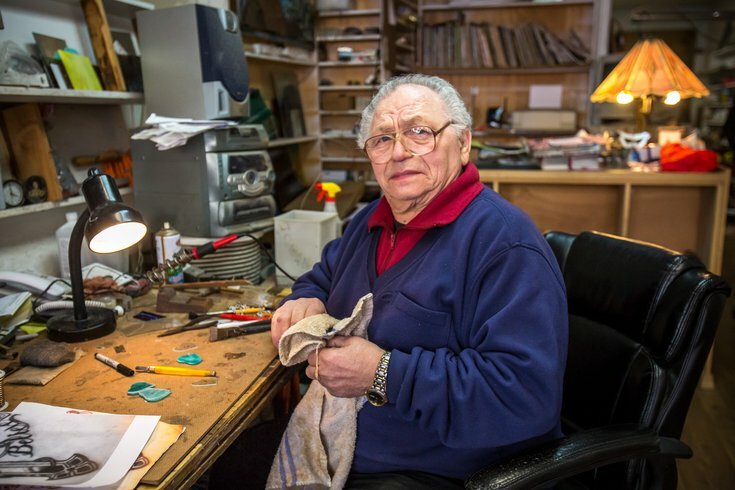 The custom stained-glass maker, along with his wife, Geraldine, has owned the little shop along Passyunk Avenue for close to three decades. It’s Christmastime, and South Philadelphia Stained Glass has seen an uptick in business, as locals who know it think of gift ideas for loved ones. They know just where to go for a custom Eagles, Phillies or Flyers stained-glass logo to hang in a window. “When I came here, there was nothing but one little restaurant across the street,” said Sorrentino. 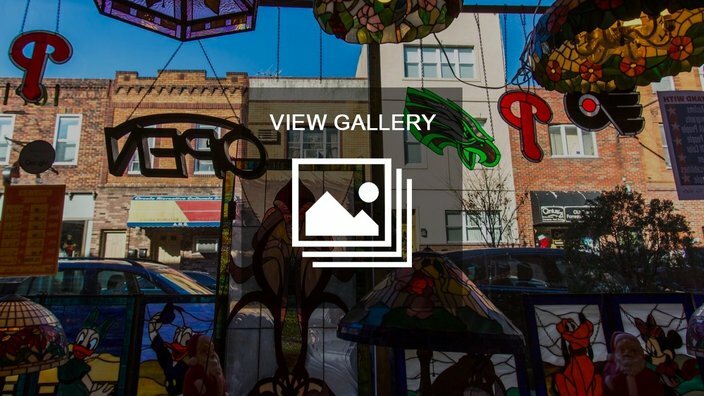 PHOTO GALLERY: South Philadelphia Stained Glass, located at 1621 E. Passyunk Ave. in South Philly has been on the avenue for 27 years. True, there's no denying his intimate shop looks well-lived in. A dusty CD-player circa 1995 might've last heard the likes of Bobby Rydell. A pair of old loafers bares the cracks of time, and piles and piles of stained glass shards occupy every spare inch of workspace in Sorrentino's store. “I was a tractor-trailer driver. I had a heart attack, and my doctor said I had to get a hobby," he said. 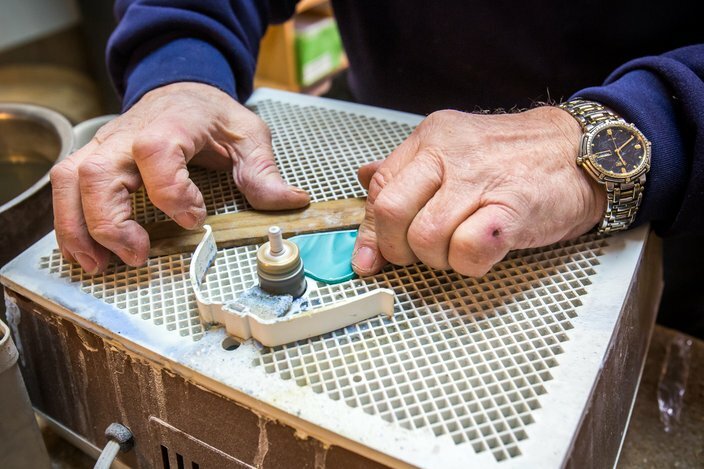 From there Sorrentino uses a diamond-tipped wet grinder to shape each piece. The Sorrentinos opened up in 1991. Back then, much like today, the bulk of their business comes from shuttered churches and the nostalgic parishioners who want to take home a piece of history. They also do transoms and pretty much any kind of stained glass projects for commercial businesses and residences. Douglas Miller, a Boeing retiree 35 years, is now an apprentice of Sorrentino’s. He said he started in June, after “bugging” Sorrentino for five years to come in and help out. 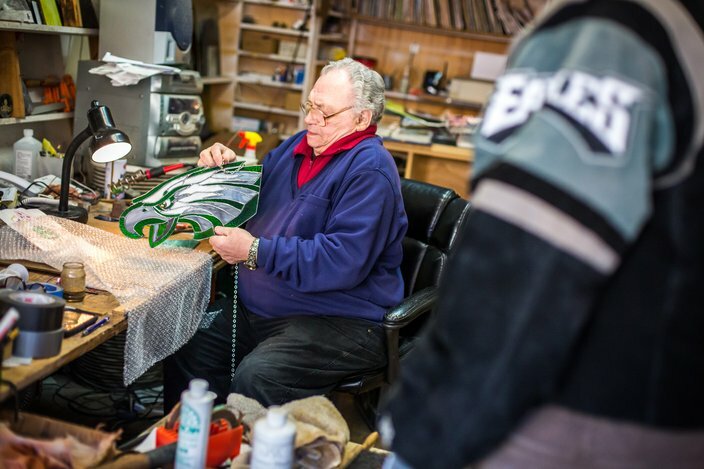 A customer wearing a Philadelphia Eagles jacket came in to buy his nephew a stained glass version of the team's logo for Christmas. He displayed an antique piece in the store’s back room that contained 185 jewels. “It’s just so intricate. It’s amazing. It’ll boggle your mind,” he said, eyes wide with awe. Sorrentino hopes (and intends) to be around a little while longer doing what he loves. “Businesses along the avenue have come and gone, but I’m still here,” he said.